There are lots of brands that I haven't had the pleasure of trying out yet. Which, unfortunately, is a side-effect of living in Europe, where a lot of brands that are popular in the USA, are not that easy to come by. Wahl-Eversharp is definitely one of those American brands that I've been dying to try, especially because of all the glowing reviews of the pens they make. Luckily, with the release of the Decoband, the brand started to break through internationally. A pleasant evolution of course. Having the option to try before you buy is not an unnecessary luxury, especially when we are talking about pens in the 1000$ realm! 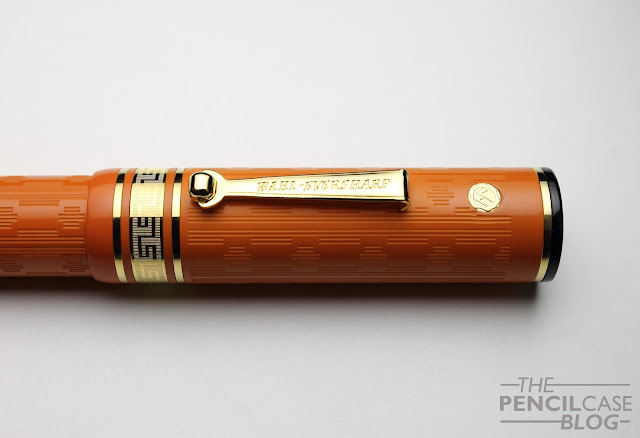 One of the appealing aspects of Wahl-Eversharp pens is their inspiration drawn from vintage design. 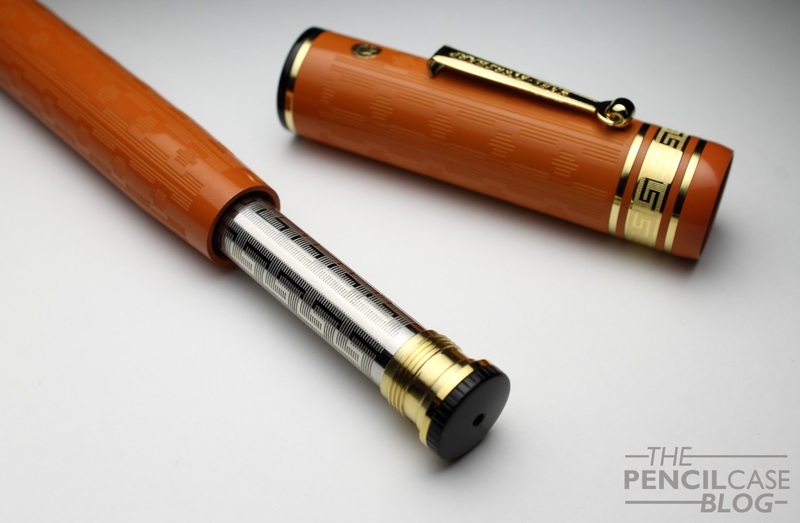 Both models, the Skyline and Decoband, are directly inspired on vintage Wahl-Eversharp pens from the early 1900's. 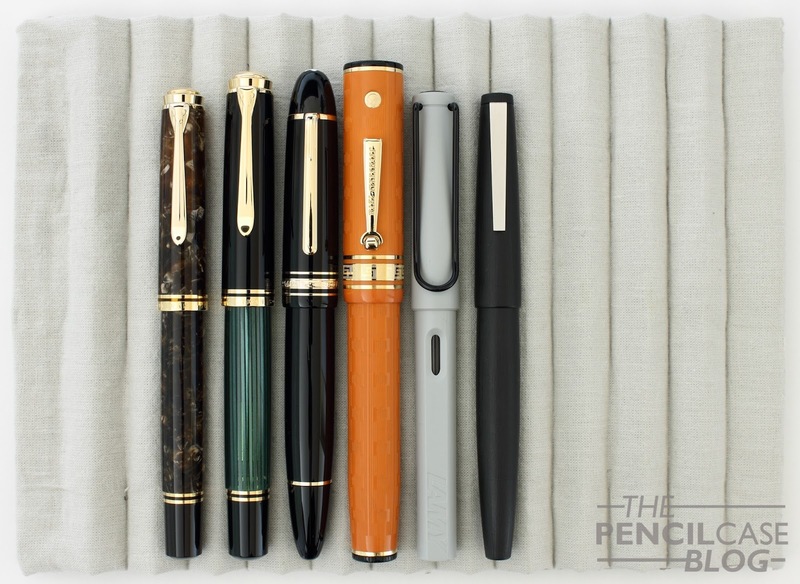 I'm always a sucker for vintage design (when done right), and the people that revived Wahl definitely have an eye for making good looking pens. 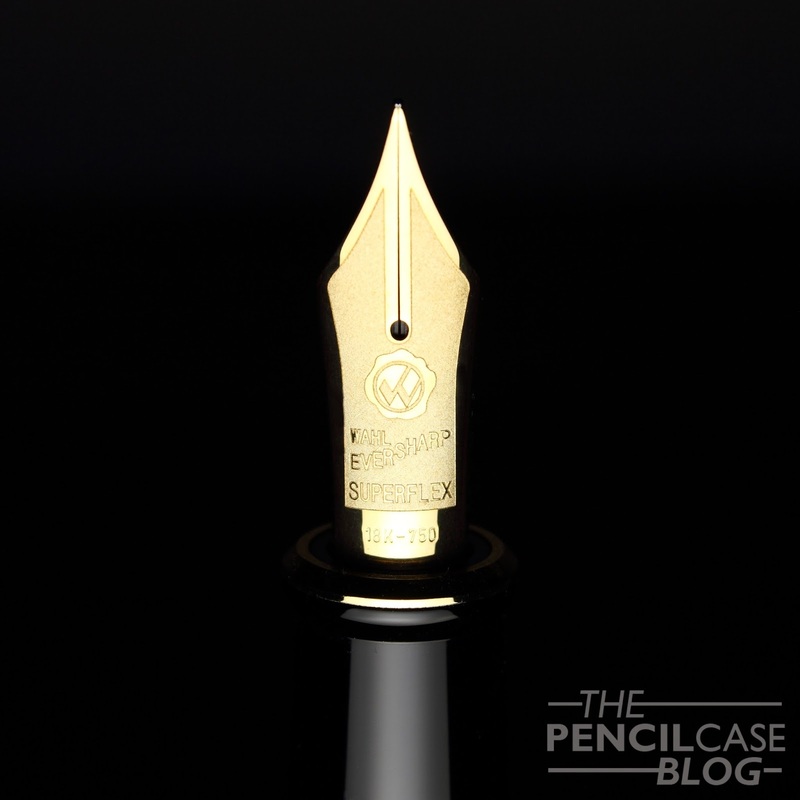 The Decoband is a stately pen with flattop design. The impressive size accentuates the flattop design, and makes it a very imposing pen. On top of that, it's also VERY orange! 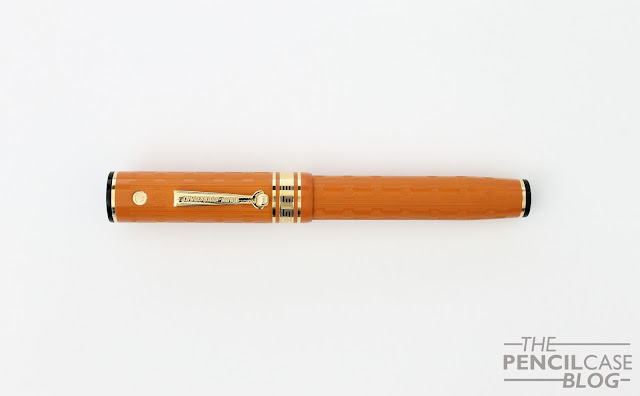 The orange ebonite with etched guilloche pattern does a fantastic job making the Decoband represent its vintage predecessors even more. It has something to do with the specific shade of orange. It's ebonite, so it has a very specific color and structure. It's sort of a pale orange, as if they had a fresh piece of material and let it sit on the shelf for a few decades. I love the way ebonite looks and feels -not so much the burnt rubber smell it has-, and on top of that it has an inherently vintage look and feel to it. A stately pen needs stately details, and that usually begins with the clip. This is one of the few areas where I think they kind of missed the ball. The design is nice, and fits the general picture, so that's good. But the production is somewhat below par. The edges are a bit rough and still show cutting marks, and the face of the clip has a strangely textured structure that doesn't look intentional. I might sound picky, but on a pen this price, I definitely won't overlook any small imperfections. Luckily, the rest of the pen is pretty much flawless. The large triple center band with greek key design draws the attention, and so does the double checkmark gold seal medallion right above the clip. The same Greek key design returns on the metal barrel of the pneumatic filling system, a great detail, even though it isn't visible apart from when you are filling the pen! I would've liked it even better if they plated the touchdown mechanism to match the rest of the gold-plated accents. The Decoband, as already mentioned, is a sizeable pen. It measures 15cm (5.9") closed, which is large but not excessive. An Edison Collier, for example, is the same length. But what makes the Decoband so imposing is the diameter: a whopping 1.8cm (0.7") at the widest point, and it barely tapers down at either side. Uncapped, it still comes in at 14.2cm (5.59"), and it weighs in at a ridiculous 58 grams total, due to the almost entirely metal inner construction of the mechanism and section. But then we come to comfort. A pen as big and heavy as this might not sound very comfortable, but the section makes up for a lot. It's on the wider side (1.35cm average, 0.53"), as is the rest of the pen. But it's long and comfortably tapered with a pronounced flared shape at the end. The threads are metal, and I have to give Wahl-Eversharp credit for making incredibly smooth threads that are almost noy noticeable. Behind the threads, there's a very small transition from section to barrel. The lack of large steps is exactly why I love pen designs with a cap that is wider than the barrel. It makes for an incredibly comfortable pen to hold. On top of that, it is long and nicely weighted along the entire length of the pen. The balance is quite central, which makes it sit balanced in the hand. Some pens are big and unwieldy, others just work. This one definitely works for me (keep in mind that I do tend to lean towards larger pens in general), and I actually find the large dimensions and weight help with flex writing. The Decoband comes with a rather interesting filling system, called: 'Chilton Style' pneumatic filler. The back of the pen unscrews, which allows a long metal sleeve to be pulled out of the barrel. You then put the nib in your ink of choice, cover the small air hole on the back finial, and push down to retract the metal sleeve back into the barrel. This creates pressure inside the sleeve, which in turn compresses the ink sac inside. When you remove your finger from the breather hole, the sac expands, drawing up ink (this takes a few seconds, so you have to keep the nib submerged to allow the pen to fill itself). It's one of the more complex filling systems I've used to date, and it requires some patience to learn how to use it (There's no ink window, so I tried it a couple times with water to ensure that I was getting a good fill). It's an original way to fill the pen, and it actually works quite well. The Wahl-Eversharp website claims a 2.1ml ink capacity. Realistically, I think you should expect slightly less from a single fill, but still that's quite a decent amount of ink. 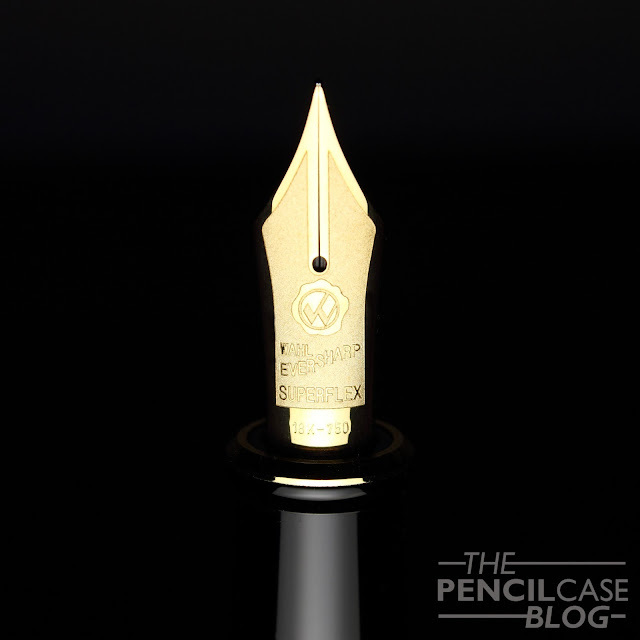 I'm sure the most exciting part of the Decoband - at least for some people- is the new 18k gold 'Superflex' nib. With a name like that, you create high expectations. So high that it's inevitable to start comparing this nib to vintage flex, and unfortunately it's still not that. It does flex, but I'd definitely still call it semi-flex! Line variation is good, but it could've been better if they ground the nib down to maybe an EF. It wouldn't change the flexibility, but it would at least make the line variation more pronounced. 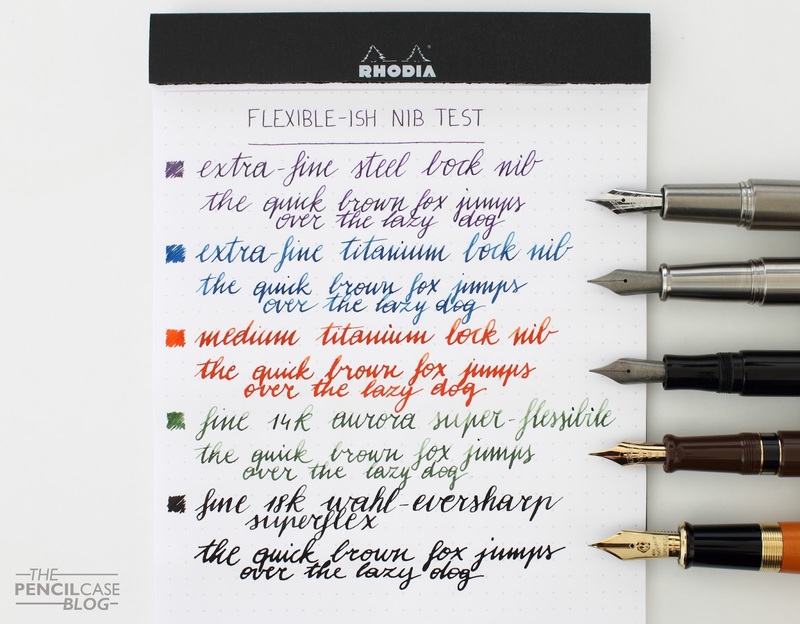 It's softer and much easier to flex than the 'flexible' nibs on the Aurora Anniversario that I reviewed a while ago (You can find this review HERE). Although I'm not sure if that's a good or a bad thing. It makes the nib feel a bit 'mushy' and unresponsive, if that makes any sense. The Aurora nibs definitely have a more controlled and crisp feel to them, but the line variation is less pronounced. The fine-ish (western fine, more like a medium) nib is superbly smooth and the custom made ebonite feed provides it with a really heavy flow that is ideal for flex writing. The wet flow is bothersome when writing without pressure. It occasionally takes forever to dry, depending on the ink and paper used. But on the upside, I never had any issues with railroading when utilizing the full potential of the semi-flexible nib. It stuttered once when I was testing how fast I could write with pressure, but that's not really a fair criticism. Taking it slow is always a good rule when you want to write with a flexible nib. Even vintage flex can't keep up indefinitely. Something that helps with the consistent flow is the design of the ebonite feed. It's made up of two parts, with one part that pushes upward against the nib ever so slightly. This improves the contact between nib and feed, so that the ink flow isn't interrupted when flexing the nib. Oh wait! I haven't even talked about how good this monotone #8 nib looks! 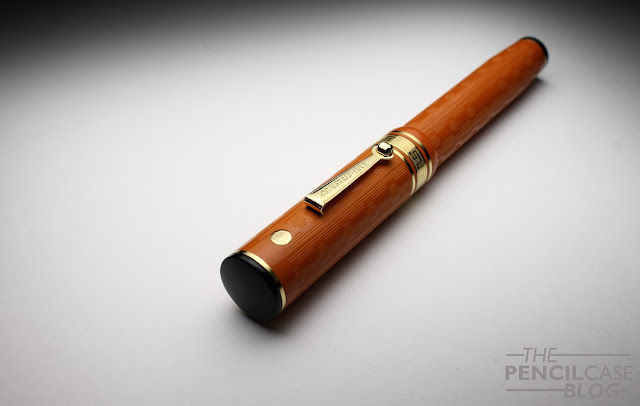 It has a pretty unique laser-etched nib face, with the company name and gold seal logo added in relief (basically an inverse engraving, if you know what I mean). The matte engraved surface of the nib is quite unique, and it catches the ink in a beautful way when you fill the pen! One small point of criticism about the nib: it did come ever-so-slightly out of alignment out of the box (so to speak, I didn't get the box as I had this pen on loan). It wasn't to an extent where it bothered me, and it took me a while before I noticed upon closer inspection of the nib. Nothing a small nudge couldn't fix, but of course these are mistakes that should be avoided on a pen in this price range! The Decoband is quite as I expected: an imposing and solid pen! It's a quality product, and I now know why Syd and Emmanuel -the guys responsible for the rebirth of Wahl-Eversharp, and more recently Omas- receive such high praise. This is definitely a worthy homage to the vintage pens. It's an expensive pen, there's no way around that. The Wahl-Eversharp Decoband comes in at 860 USD (980 EUR including taxes when you buy from Sakura Fountain Pen Gallery). 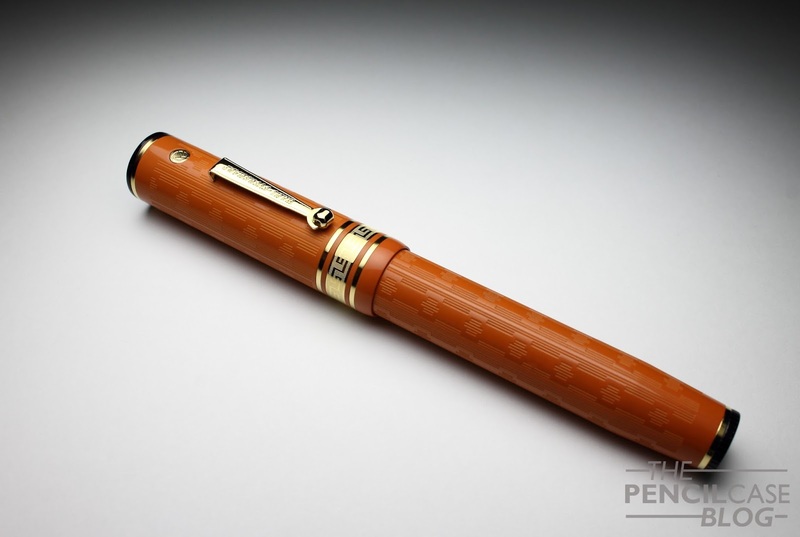 The Gatsby version with etched guilloche pattern, such as the one I reviewed here, commands a premium over the standard versions of 35 USD when bought directly from the Wahl-Eversharp website. Here in Europe, the price increase for the Gatsby finish is 170 EUR. Before you ask, I absolutely have no clue why the premium is so much higher here in Europe. Saying you get your money's worth on a pen in this price range is always open for speculation. 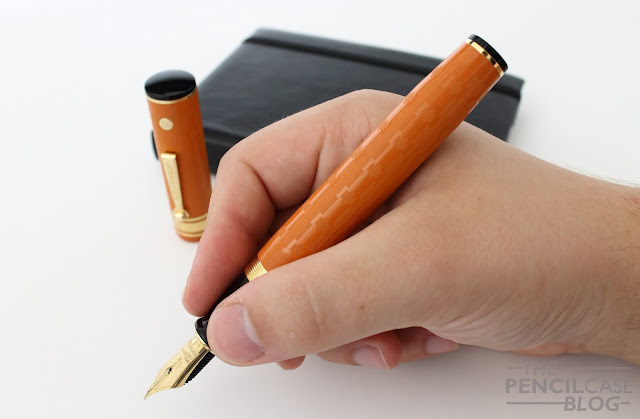 But I sincerely think that you get a pen that has a lot to it, with a fantastic design and a great semi-flexible nib. 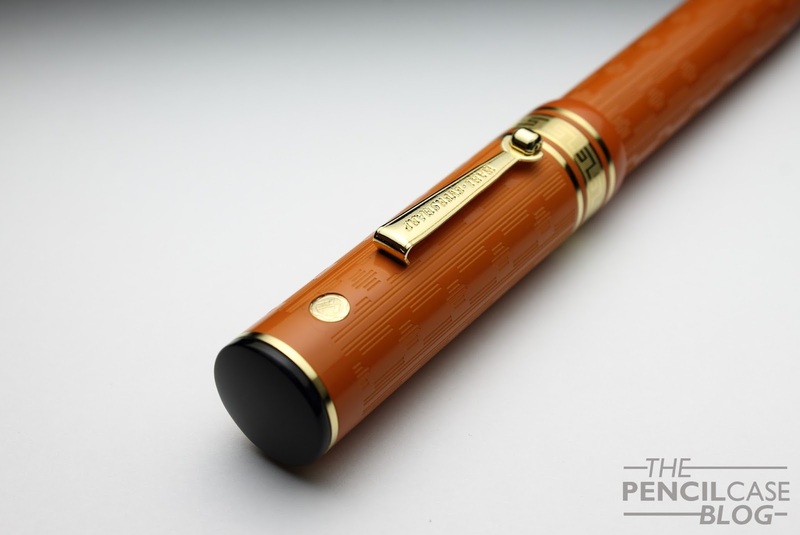 Especially if you like larger pens, this is one that you should take a look at! 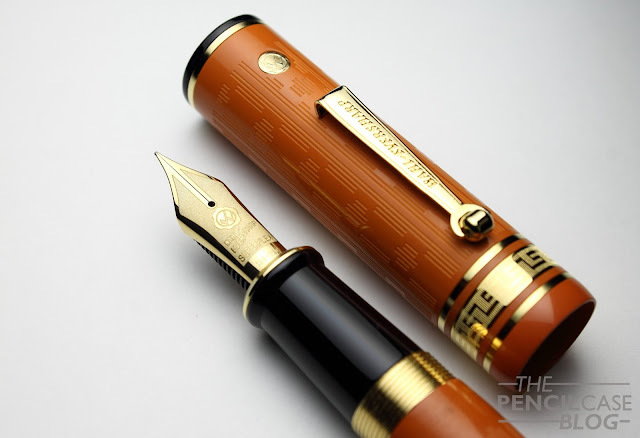 If the premium for the Gatsby (available in black or orange ebonite) is worth it, is a matter of personal taste. 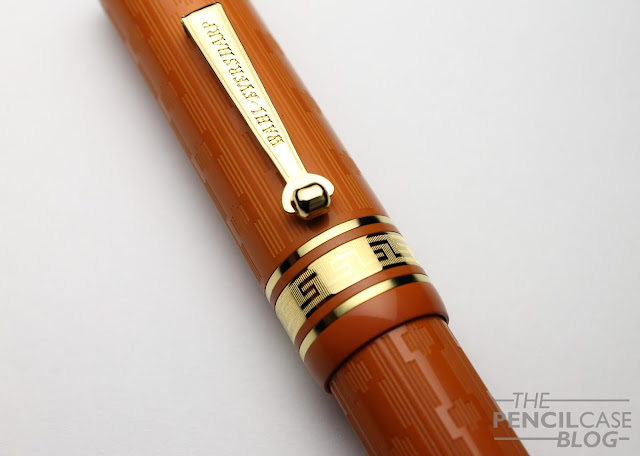 I quite like the guilloche pattern in combination with the orange ebonite, but I'd personally be more inclined to buy the 'rosewood' ebonite version. This product was sent to me on loan by Sakura Fountain Pen Gallery so I could write this review. I was in no way influenced in the making of this review, the opinions shared in this review are completely my own! This post does not contain affilate links. Flexible writing sample, on Rhodia Dotpad paper.